If you already have the AWS snapshot of the SAP media required for the deployment of SAP Business One, version for SAP HANA, skip to step 4. In this step, you will log in to the RDP instance that was created in step 2 to download the SAP media required for SAP Business One, version for SAP HANA, from the SAP Software Download Center (SAP Support Portal access required). When you've downloaded the SAP media, you will need to extract the media into the required folder structure and take a snapshot of the media volume. 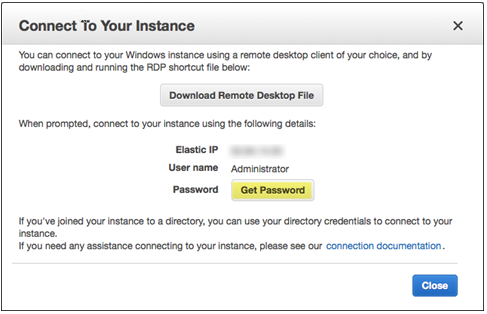 In the Amazon EC2 console, select the RDP instance, and then choose Connect. In the Connect To Your Instance dialog box, choose Get Password, and then provide the private key of the key pair that you created in step 1, when you set up your AWS account. Connect to the RDP instance by using any remote desktop client with the public IP address, administrator user, and password. After you connect to the RDP instance, open Windows File Explorer and create the folder structure for drive D shown in Figure 8. This folder structure is critical. The SAP Business One media has to be placed in the appropriate folder in order for the AWS CloudFormation template to complete the deployment successfully. If you want to stage more than one version of the SAP Business One media, create another sub-folder under B1HANA_MEDIA (for example, called B1HANA_920 for SAP Business One version 9.2) and follow the same folder structure shown in Figure 8. Use any browser of your choice to log in to the SAP Service Marketplace (SAP Service Marketplace access required). From the SAP Support Portal home page, navigate to the Software Downloads page. All SAP HANA-related files required for the SAP Business One installation are delivered as multipart RAR files. When you extract the RAR files, you will find different folders under DATA_UNITS for HANA AFL, Client, Database, and Studio. Below these folders, you will find SAR files for different operating systems. For example, under the SAP HANA Client folder, you will find HANA Client for Windows 64-bit, Windows 32-bit, Linux 32-bit, and Linux 64-bit. You will have to extract each SAR file into the appropriate target folder structure, as shown in Figure 8. SAP Business One installation files are also delivered as multipart RAR files. When you extract the RAR files, a new folder will be created with the installation files. You will need to copy the extracted folder to the D:\B1HANA_MEDIA\B1HANA_version\Common folder. You need the Windows version of the SAPCAR executable to extract the downloaded SAR files. From the SAP Service Marketplace software download page, choose Search for Software. In the search window, type SAPCAR, and then choose Search. From the result set, download the latest version of the SAPCAR executable for the Windows on x64 64bit operating system. Save the downloaded SAPCAR executable in the D:\B1HANA_MEDIA folder. where sar-file is the SAR file name. Figure 9 shows the final folder structure when all the required SAP Business One media have been downloaded and extracted into the appropriate folders. Create a snapshot of drive D. You will use this snapshot in the next step when you launch a template to deploy SAP Business One, version for SAP HANA. Take drive D offline. From Windows Server Manager, choose File and Storage Services, Volumes, Disks, and then right-click the storage volume and choose Take Offline. Open the Amazon EC2 console, and choose Volumes in the navigation pane. 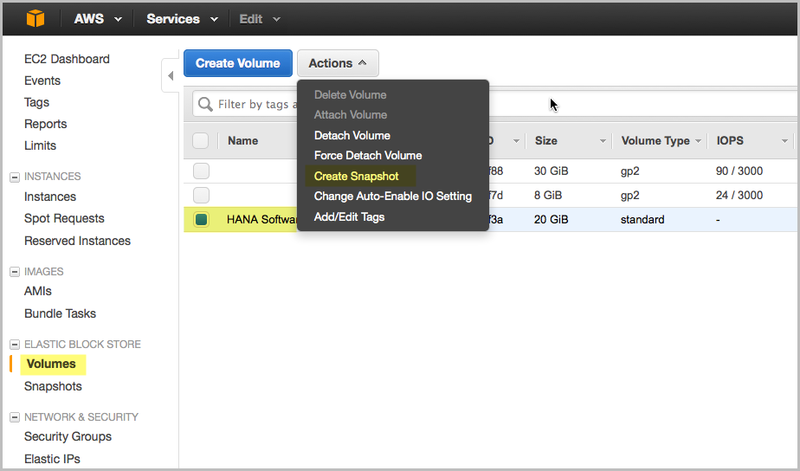 Select the volume named HANA Software Download Volume, and then choose Actions, Create Snapshot to create the snapshot of the volume (Figure 10). You can view the progress of your snapshot by choosing Snapshots from the navigation pane. Note the snapshot ID. This snapshot will be used in the next step. Optionally, when the snapshot is complete, you may attach the volume to the RDP instance if needed (choose Actions, Attach Volume, and then select the RDP instance to attach the media volume back to the RDP instance). When the snapshot is complete, you can bring drive D back online. From Windows Server Manager, choose File and Storage Services, Volumes, Disks, and then right-click the storage volume and choose Take Online.